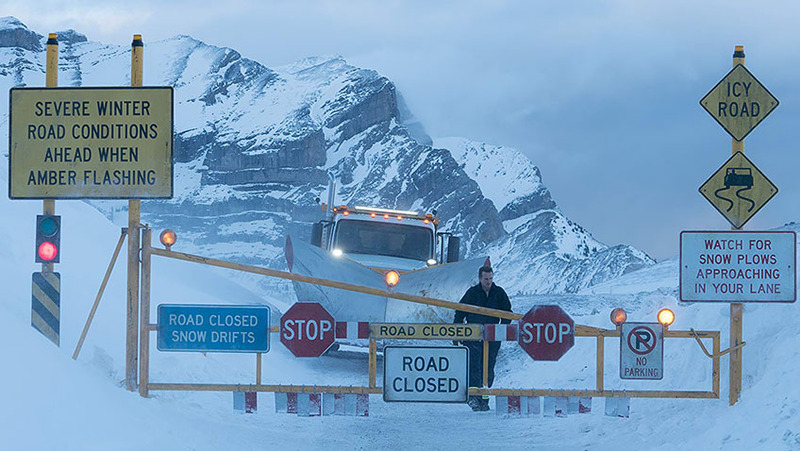 Joyce Glasser reviews Cold Pursuit (February 22, 2019), Cert. 15, 118 min. 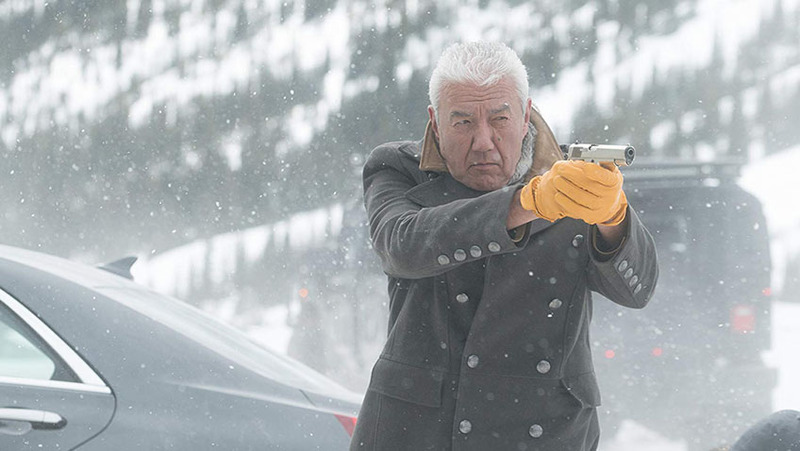 The purpose of Cold Pursuit, Norwegian director Hans Petter Moland’s English language remake of his highly original, quirky, black comedy Kraftidioten (In Order of Disappearance) is to reach a wider order. And toward that end, the producers cast the bankable Liam Neeson, who has played the heroic father in revenge thrillers so many times since 2008, that he can do it, as here, in his sleep. 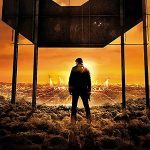 So while Neeson might seem the obvious choice to step in the shoes of Kraftidioten’s Stellan Skarsgård, there are two problems. 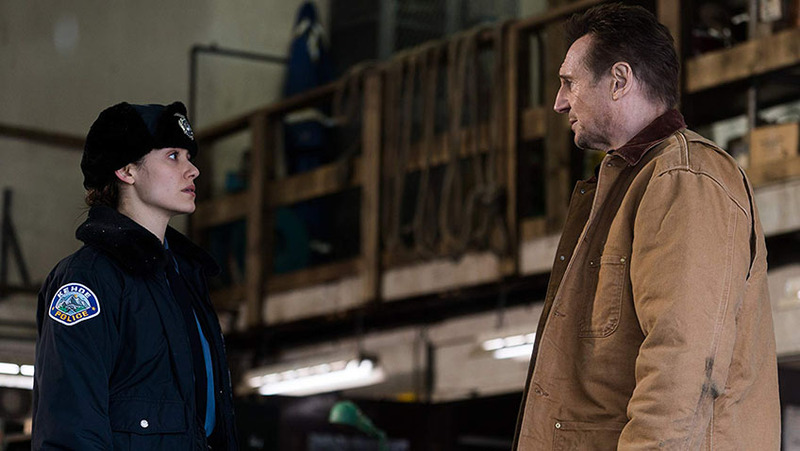 Neeson doesn’t do black comedy and in Cold Pursuit his character is less a hero than a serial killer. 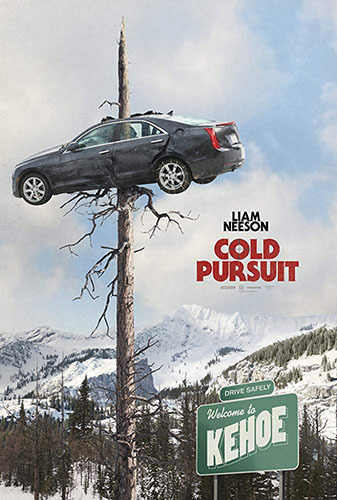 The ‘pursuit’ in the title indicates that this is an action film, and the ‘cold’ refers to the setting of Denver, Colorado in winter. Presumably this location was chosen not only because it is cinematic, but because, in line with the original, Neeson plays rugged, macho outdoorsman Nels Coxman who ploughs the tough mountain roads in the dead of night so that others can go about their business in the worst snowfalls. When the film opens Coxman is being honoured in a Citizen of the Year ceremony, the irony of which will soon become apparent. Nels’ surname, by the way, mirrors the original’s ‘Dickman’, both names being the objects of puerile jokes. Nels attends the ceremony with his wife, Grace (an underused Laura Dern), while their only son, Kyle (Micheál Richardson), is being abducted and killed by a heroin injected. Kyle is the victim of a drug syndicate that uses the local airport where he works to smuggle in shipments of cocaine. Kyle becomes implicated when his co-worker, Dante (Wesley MacInnes), tempted by a quick buck, gets involved with the gang. In the original, Albanians, Serbians and Norwegians share Norway’s drug trade. Here, Nels’ quest to find the man behind Kyle’s murder triggers a turf war between drug baron Trevor ‘Viking’ Calcote’s (Tom Bateman) and a group of Native Americans under Chief White Bull (Tom Jackson). Calcote is puzzled by the disappearance of his three top henchmen because a truce is in place with White Bull and he has done nothing to ruffle their feathers. But Calcote is a short-fused psychopath who makes the mistake of retaliating by killing White Bull’s son and nailing his body to a road sign. Kehoe is a ski resort, so there are presumably a sufficient number of wealthy clientele looking for cocaine to sustain two rival syndicates, although finding an Indian reservation within two hours of Denver is more problematic. As for Eskimos, the only black actor in the film, Arnold Pinnock, plays a double-crossing hit man known as the Eskimo, more for his skill at icing people than as a description of his ethnic background. Denver’s drug trade is presumably not very diverse. Each of the three henchmen Nels has tracked down, lead him closer to the name Calcote, or The Viking, but terminating him is apparently another matter. On the recommendation of his brother Brock (William Forsythe), a retired criminal, Nels hires the Eskimo to do the deed. As in the original, all of the criminals have monikers, and, as in the original, Moland breaks the fourth wall by inserting captions identifying each of the dead men. The first such caption might be humorous, but as the body count rises, it grows tedious. With the exception of eager new Police recruit Kim Dash (Emmy Rossum), whose role reminds you of the far superior films, Fargo, the women in the film are negligible. Grace, for some reason, is quick to believe the police’s conclusion that her son is a junkie; and Brock’s bimbo wife does not speak English. We are supposed to chuckle at the sexism, when, for instance, Calcote’s henchmen ‘Bone’ (Gus Halper) leaves $20 ‘tips’ on his private parts as bait for underpaid hotel maids. While not afraid to stand up to her ex-husband, Calcote’s ex-wife knew he was a drug dealer when she married him. Their son Ryan (Nicholas Holmes), a bright, sensitive, kind boy of about 11, and the complete opposite of his father, has to be kidnapped. The film looks good and red splattered on white (not only snow but also wedding dresses) becomes a visual motif. The Viking, who is a health-food fanatic, lives in a well-guarded post-modernist glass villa that is as impersonal and sterile as a hotel. His house is contrasted with Nels’ roomy but cosy, stone and timber mountain lodge full of family photos (there are no books in either house). Even Ryan feels more at home in Nels’ house than in his own and seems happy to have been kidnapped. But aside from the sexism and racism (in no way mitigated by White Bull’s observation that ‘Native American’ scarves in the hotel gift shop are made in China) and all the cartoon violence (Mitchell Saddleback’s character dies laughing on a snow bank and Nels, joins him), there are too many inconsistencies and holes in the plot for the audience to feel any genuine tension. Nels has no problem collecting Ryan after school when you would expect him to have a permanent body guard. Elsewhere, the bodies of White Bull’s son and Brock are presumably found, but their murders are not investigated by higher authorities. Can the gratuitous body count be justified by a moral theme? The film certainly warns about the unstoppable ripple effect of a crime. But that is the theme of countless plays and films from The Revenger’s Tragedy and Lorca’s play, Blood Wedding to The Godfather. It was in publicising this film that Liam Neeson told his now arguably racist anecdote about how an ordinary non-violent man, like himself, would be driven to revenge. You might forgive this error of judgement, but it is harder to fathom one of the film’s most tasteless scenes. Neeson’s real-life son plays Kyle. Nels visit to the morgue to identify Kyle’s body is turned into a sound gag that is meant to be humorous, but backfires. Perhaps a few of us were thinking of Kyle’s mother, Natasha Richardson, who died from a skiing accident (not in Denver, but in Canada). 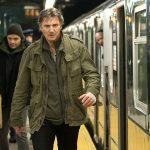 Liam Neeson – It ends here!